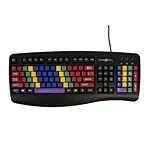 The LessonBoard Pro is color-coded by zone to show correct finger placement on a computer keyboard. Now without letters printed on the keys, the "Pro" helps improve keyboard memorization, accuracy and speed, while requiring students to concentrate during testing. Plus, color-coding is known to help anyone who may have cognitive or physical differences that restrict learning.